According to new study Iceman, the 5,000-year-old mummy found frozen in the Italian Alps, have come up with a new theory for how he died, saying he died from head trauma, not by bleeding to death from an arrow. Just two months ago, researchers in Switzerland published an article in the Journal of Archaeological Science saying the mummy - also known as Oetzi - had died after the arrow tore a hole in an artery beneath his left collarbone, leading to massive loss of blood, shock and heart attack. But radiologists, pathologists and other researchers, using new forensic information and CAT scans, said Tuesday they believed that the blood loss from the arrow wound only made Oetzi lose consciousness. They believe he died either by hitting his head on a rock when he passed out or because his aggressor attacked him again with a blow to the head. The researchers presented their findings Monday night at the Institute for Mummies and the Iceman at the European Academy in Bolzano, a research institution. The mummy institute was launched in July to coordinate research into Oetzi, who is housed in the nearby South Tyrol Archaeological Museum. In a statement Tuesday, the academy said the findings reopened the debate over Oetzi's cause of death, particularly since they took into account the rather unnatural way in which his body was found: face down, with his left arm across his chest. The researchers believe the Iceman fell over backward, but was then turned over onto his stomach by his aggressor who then pulled out the arrow shaft while leaving the arrowhead imbedded in Oetzi's shoulder. The researchers were: Andreas Lippert, a prehistory professor at the University of Vienna, Dr. Paul Gostner, a radiologist at the Bolzano regional hospital, Dr. Eduard Egarter Vigl, a pathologist at the Bolzano hospital, and Dr. Patrizia Pernter, a radiologist at the hospital. 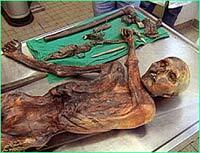 Oetzi was found in 1991 by accident by a group of hikers. In 2000, his body was temporarily thawed so that researchers could take samples to study. They have found that his last meal included unleavened bread made of einkorn, a type of wheat, as well as some greens. DNA from the contents of his intestines showed he had also consumed venison as one of his last meals - strengthening the theory that he was a hunter. While little else is known about Oetzi himself, he was carrying a bow, a quiver of arrows and a copper ax.